I have an important question to ask you. Are you loving yourself deeply and prospering, feeling the richness of your life and deep joy? Or, are you blocking yourself in some way that has you left feeling stuck in the mud – feeling disempowered and in slow motion? Have you taken the time to go within and listen to yourself? You talk to yourself. You do. We all do. And the voices in your head can have you question your ability to create a successful, happy life. Negative self-talk wreaks havoc on your spirit and creates a state of being that is quite the opposite of how you really want to feel – and I know you want to feel magnificent. You are not good enough to have a loving, juicy relationship. Who do you think you are to start your own business? You can’t do that! There are other people who are better than you, so don’t even bother, you’ll just fail! Ugh. These thoughts create feelings of fear, sadness, shame, and anger. They create sabotaging behaviors like procrastination and addictions. They stop you from taking action toward the life you want. The life you deserve. 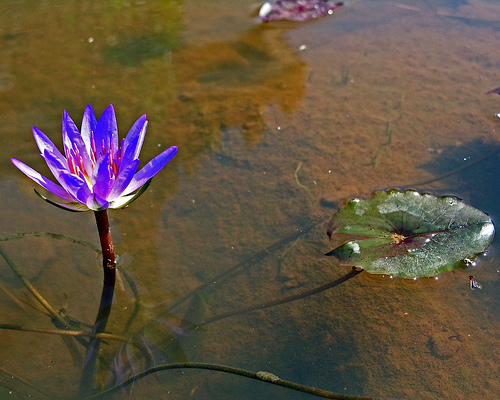 Just like the lotus flower grows out of the mud, so can your “dirty” thoughts spring forth a beautiful flower. What that means is, you have a lotus within you. Inside your emotional muck and mire awaits a precious flower and it wants to push through and thrive. By waking up and shining a light on these unpleasant, mean-spirited thoughts, great things can happen for you. When you know what is causing your challenges, where the old limiting B.S (belief systems) come from, you can then release the old and bring in the new. You can transform the old messages and grow your lotus life. Gaining the clarity of what is tripping you up and causing these debilitating thoughts allows you to rise up into your greatness. You can give birth to the most beautiful of flowers because you are meant to blossom and shine your light. Close your eyes. Take a deep breath. Think of something you are longing for. Something meaningful. Now ask yourself what stops you from having it? Is there a thought or limiting belief that has you think you can’t have it? Give yourself a moment to really hear that thought. What are you feeling? Just notice what comes up for you. Be with it. Notice how your body feels just thinking you can’t have it? Notice how your belly feels? Our belly tells us a lot! Now, take the limiting belief and say the opposite to yourself. See yourself having what you desire. See it. Feel it. Own it. Breathe it in. Sounds simple right? This is a quick way to change your beliefs. By practicing and welcoming these new empowering thoughts, your body responds and gets reprogrammed. It helps. Try it. Practice daily. Tell yourself the positive messages and feel your joy grow. Affirmations and positive thinking can only take you so far. To really shift the old patterns of thinking – and have it stick, working with a trained transformational practitioner like myself is key. Having someone outside yourself brings in a perspective that you just can’t get on your own. Once you see what’s truly going on, the healing can begin and the shift will take hold. If you are not getting the results in your business or life you want and feel stuck in the muck and mire and want to take the bull by its horns before this year is over, I want to speak with you. I have room in my practice for 3 people who are committed to their lotus evolution. Click here to have a chat with me. This is a 60 minute complimentary discovery session. Let’s dive in and see what you want and why you don’t have it. I want to see you flourish! Don’t you?